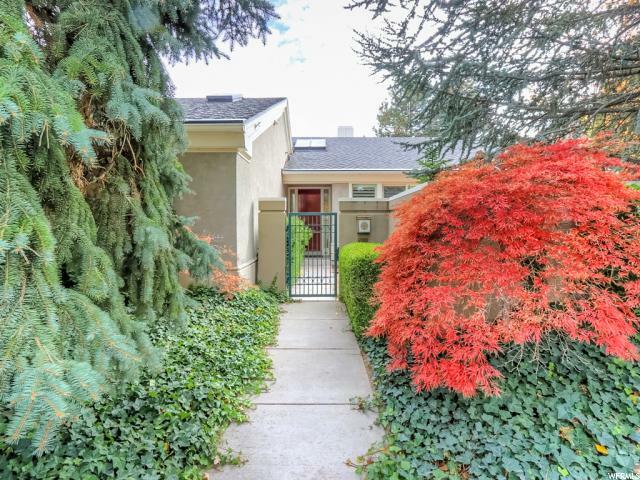 All TALL OAKS homes currently listed for sale in Salt Lake City as of 04/18/2019 are shown below. You can change the search criteria at any time by pressing the 'Change Search' button below. "Stunning one owner custom home in the ultra exclusive gated enclave of Tall Oaks. This is the most beautiful setting of amazing trees, ponds and streams with mountain views. The community pool is on an island in the main pond. There is a tennis court and two pickle ball courts. This home is on a premium corner lot with nice privacy and open space views. California contemporary style showcases walls of glass and patios flowing from most rooms. High ceilings, lovely Italian marble and neutral designer decor enhance. A huge open great room has a crisp marble fireplace and room for multiple seating areas. Formal dining has elegant built-ins and a reflective mirror wall. The custom kitchen looks brand new and has top grade appliances. Two bedroom suites and a nice den each have amazing patios adjoining. The master is perfect with dual wardrobes and a garden bath. A giant basement is finished and can be rec space or storage. This is a premium quality home of great appeal!" "Remodeled home in exclusive Tall Oaks gated community. Private cul-de-sac location which backs onto lovely manicured gardens and stream. Move-in condition. Three large bedrooms. Open floor plan enhanced with tall ceilings, beautiful Brazilian cherry floors and huge windows with plantation shutters overlooking gardens and stream. Additional flex room which can be formal dining or cozy den. Large master features double walk-in closets. Finished lower level includes comfortable family room with bathroom ideal for a game room or theater. Square footage figures are provided as a courtesy estimate only. Buyer is advised to obtain an independent measurement."